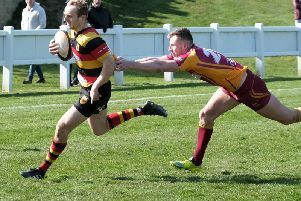 Harrogate RUFC’s director of rugby Dave Doherty is confident that his side will make an immediate return to National Two North next season. The Rudding Lane outfit were relegated after they failed to better Yorkshire rivals Sheffield Tigers’ result on the final day of the 2016/17 campaign. Yet Doherty expects to keep the nucleus of his promising young squad together despite the demotion and believes that doing so will leave the Aces well-equipped to bounce back at the first attempt. “I’m very confident that we can come straight back up, we’ll be doing everything we can to make sure that happens,” he said. “It will be extremely difficult as National Three North is a tough division and we’ll be up against some strong sides, but I’m hopeful that we’ll keep the vast majority of our current squad together and be well-equipped for the task. “It’s inevitable that some of our players will move on, and we’ll never stand in the way of lads with ambition, but most of this squad enjoy the environment here. Doherty’s men went into the last fixture of the season inside the division’s bottom three, but knowing that victory at Hinckley, combined with the outcome of fixtures elsewhere going in their favour, could still see them beat the drop. “Having played so well at Hinckley and been ahead all the way through the game, to lose 32-31 in the 79th minute is really hard to take,” Doherty continued. “In the end, our result was irrelevant because Sheffield won, but it would have been nice to finish off with a victory.